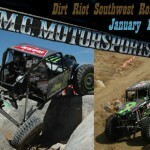 PLACERVILLE, CA JANUARY 3, 2012: The 2012 Dirt Riot Series will kick off in Tucson, Arizona Saturday January 14th at the MC Motorsports Park. 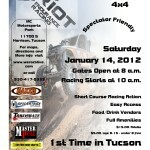 Pre race meet and greet will be held at 4 Wheel Parts in Tucson, Arizona on Friday January 13th from 3pm to 6pm. Dirt Riot racing is a combination of high speed rock racing and technical rock crawling that invites all types of 4 wheel drive vehicles from professional rock racers to stock jeeps and UTVs to take the green flag. The course is visible by spectators and is family friendly racing. “We are excited to be at this Tucson location,” said Rich Klein, President and founder of W.E. Rock Events. “This race is planned to be a shake down for a lot of the King of the Hammers racers, so we are expecting some of the big names to come out and race.” The course will be about 5-6 miles in length, incorporating parts of the rock crawl area, most all of the tuff truck course and a desert section with washes and tight technical sections. The pits will be right on the edge of the race course with a hot pit lane between the race track and the main pits. Quick stops will happen in the hot pits and major repairs can proceed to the main pits. There are multiple classes including 4400, 4500, 4600, Sportsman Trail Classes and a UTV Class. Local participants are encouraged and welcome to race and 4400 team members have the ability to race in the other classes with the schedule. “Friday night the drivers and the vehicles will be in town at 4 Wheel Parts,” said Klein. “This is a great time to see what the vehicles really look like and meet the drivers.” 4 Wheel Parts has graciously opened their parking lot to the flood of racers and hope that people will take the opportunity to come by to check out the vehicles and pick up coupons for the race on Saturday. The address is 4001 E Speedway Blvd Tucson, AZ 85712, phone number 520-881-4108. 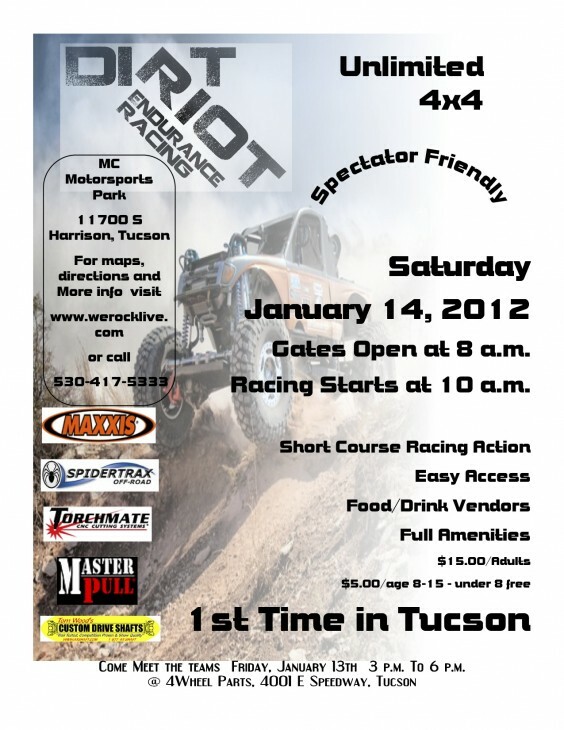 For more details go to http://www.werocklive.com/events/event/dirt-riot-southwest-1/ Gates open at 7am on Saturday January 14th with racing starting at 8am. Ticket prices are $15.00 for adult, $5.00 age 8-15, and 7 and under are free. Racing goes until approximately 5pm with awards immediately following. There are vendors, food and amenities on site.